The firm and its talented personal injury attorneys have been chosen among the first lawyers in the state to test out a cutting edge 7D Hologram technology right here at the Nashville courthouse! 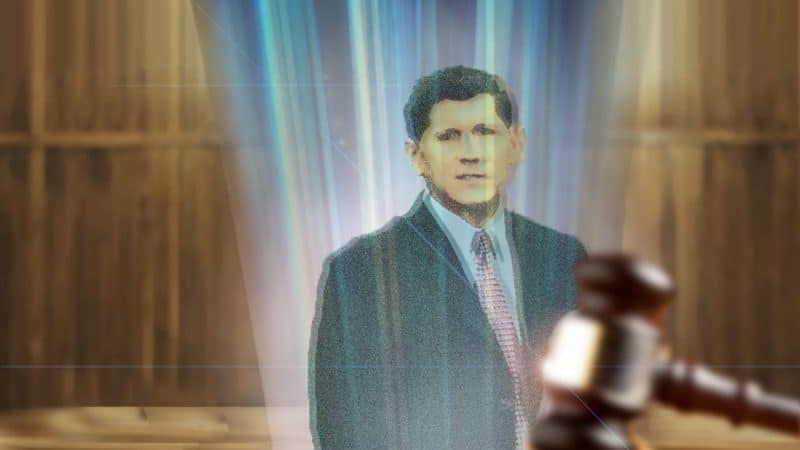 The Hologram Lawyer Program (HLP) uses live Holography to simulate the physical manifestation of an attorney appearing before a judge for day to day court proceedings. In case you haven’t watched your share of ol’ sci-fi movies recently: A hologram is a multi-dimensional image formed by the interference of light beams from a laser or other coherent light source. Traditionally, one beam is shone directly on the recording medium and acts as a reference to the light scattered from the illuminated scene. Holographic technology, which was first invented in 1962 by Russian Scientist, Yuri Denisyuk, has come a long way. A little over 50 years have passed, and those once unbelievable 3D image projections have turned into 7D live video projections in full, vivid color. The ground-breaking tech now holds the ability to project the subject with crystal clear audio and visual clarity in real time. The process begins with two identical devices (which between them) share 235 nano-tech, 360-degree video cameras and 16 hi-density infrared lasers. Those devices are placed directly onto the floor in front of the subject at his or her law office. Then, at the courthouse, a ¼-inch thick double-walled space-age polymer tube which stands 7 feet tall by 2 feet in circumference on top of a motorized base is moved into position at the podium where a lawyer would typically stand within the courtroom facing the judge. Once the lawyer at his or her respective location receives a confirmation of readiness from the courthouse’s location, the whole transactions becomes very much like video conferencing, except the subject has the capability to step outside of the format and limitations of the flat television screen and breathe life into thin air. The first beta test is coming up on April 1st and will be conducted by April Fools Labs, Incorporated, a NASA affiliate. Scientists say the test’s success is largely based on the believability of the story you just read, and your ability to reach this last paragraph to find out that we made the whole thing up. Gotcha. Wait! No hoax here. We Promise. AI is coming to Law Firm! Though interweaving holography into our everyday legal work may not be part of the forecast for another decade or so, artificial intelligence definitely will be (sooner rather than later). Rocky McElhaney Law Firm has consistently been on the forefront of utilizing the latest trial and legal technologies. We’ve led the way in adopting greener office initiatives, and we’re constantly re-aligning ourselves with the changing industries’ best practices so we can be the law firm our clients deserve. And now, we have reached the shore of our next frontier- Artificial Intelligence (AI). Digital advances in recent years could ultimately lead to the existence of an entire augmented reality for law offices. We’re not talking about robots taking over the jobs of people, we’re talking about using our people in smarter ways to make the personal injury process easier and more expeditious for our clients. Expedite the process of finding background information on Defendants. Perform the methodical and customized legal research necessary to help determine liability. Sift through decades of legal data (using machine learning algorithms) to find relevant case documents and key points. Help lawyers better determine the risks associated with cases as well as the chances of achieving the desired outcome based on analysis and comparison of specific metrics within vast amounts relevant legal data. In order to hold our ground in the fight for justice, our focus must always be on our clients’ experience and their overall outcome they receive with us. Leveraging the power of AI in everyday office and operational applications as well as our cases themselves, frees up more time for our staff to spend combing through finite case details, strategizing, and answering questions for each and every client. We are excited for the opportunities the future holds, and that’s no April foolin’! When you need to hire an attorney, you don’t just want any lawyer. You want The Best Attorney in Nashville. Rocky McElhaney and his team of hard-hitting gladiators in suits have been voted “Best of Nashville” by Nashville Scene Magazine four years in a row. The firm has received countless 5-star reviews across the internet from clients telling their story about how the Rocky McElhaney Law Firm changed their life. If you or loved one has been injured in car, truck or motorcycle wreck due to the negligence of another, we’re here to help. We’ve been aggressively serving injury victims across Tennessee and the Southeast since 2006. At our firm, we don’t back down because the fight is big, or the battle is tough. We’re not afraid to roll up our sleeves and we never take our sights off your best interests. Have questions? Need a free consultation? Give us a call today at 615-246-5549 or complete our contact form by clicking here.